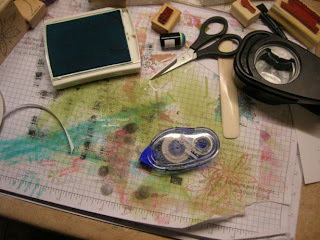 So you're probably thinking, how can she create with all that stuff in her space? Well, let me tell you, some of the best cards for my past classes have been created in a space just like this one! 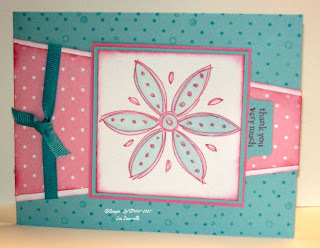 Today's card features - Doodle This, Petals & Paisley DS Paper, Polka Dots & Paisley and the Round Tab Punch all from the Spring Mini Catalog. I used All Year Cheer II for my sentiment. Don't forget, All Year Cheer II - is one of April's "Say it with Stamps" promo items - be sure to see my April email that was sent out earlier this week for more details, or click the above link.